I invite you to explore & enjoy the world of Deborah M. Pratt. I learned the lesson of science and historical fact or fiction as a foundation for truth when I did Quantum Leap. I am a huge proponent of basing my fiction in as much science and history as I can to ground it in reality. I was asked about the structure of TV Producing and thought I would share - The producers role in TV is different in many ways from film so let me focus on TV for this posting. Ranking: Executive Producer - creator/writer (Myself, Shonda Rhymes, David E Kelly, David Shore, JJ Abrams, Aaron Sorkin). Fallen angels, voodoo magic, and intense passion combine in the first paranormal romance novel from Quantum Leap co-creator D. M. Pratt. 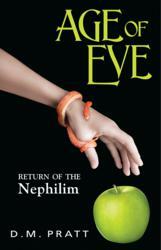 BroadLit, a company introducing a new slant on romance, is publishing the first novel in award-winning D. M. Pratt’s new romantic thriller series Age of Eve: Return of the Nephilim. The series introduces readers to a passion of mythological proportions that will captivate the reader’s body, mind and soul. We live in a world based on mythology, driven by desire and fear. Humans created answers to unexplained phenomenon based in primordial facts that spawn from evil and our need to find the good that lies within. From as far back as the Babylonian and Assyrian religious beliefs, the existence of the Nephilim, the first prototype beings created in the Universe, too powerful and banned from earth, have been searching for a way back. In this new Age of Light, I envision a world where the haze of hate and greed are lifted. Where humans see the humanity in each other. Where they begin to love, in the purist form, each other and everything on the planet. I pray that in this great shift we have no need to own and control, no need for money and understand that we remember we can manifest everything by the power of thought and in the name of love. In the course of my life, I have become aware of a wealth of Inner Knowings. As I awaken into spiritual consciousness I discover and understand all that reside inside the core of soul. Theses Inner Knowings come with our individual DNA and are the pathways to or collective souls. Some Inner Knowings are profound, some are simple, all are important.